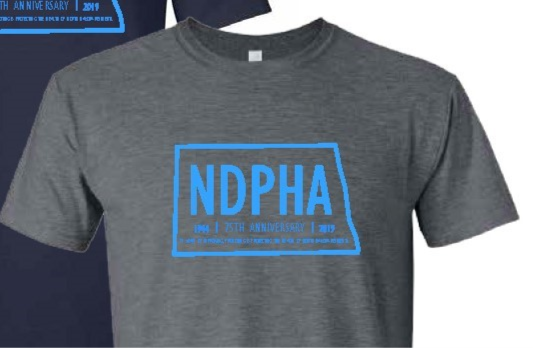 Pre Order your NDPHA 75th Anniversary T-Shirt Today! In light of NDPHA's 75th Anniversary this year the governing council will be selling 75th Anniversary t-shirts as a fundraiser! Shirts can be pre-ordered though our website until Sunday April 30th at 11:59 p.m. There will be a limited amount of shirts available for purchase the the NDPHA Annual Meeting on Tuesday June 11th. PRE ORDER DEADLINE - Sunday April 30th at 11:59 p.m. Please Note: There will be t-shirts available for purchase at the annual meeting, however sizes will be limited. We encourage you to order your t-shirt ahead of time in order to get your desired size. PICK UP ONLY - T-Shirts can be picked up at the NDPHA Annual Meeting held in Minot on Tuesday June 11th or at the NDPHA booth. Shirts can also be picked up at Bismarck Burleigh Public Health. Select the t-shirt photo to your left to be directed to the order page. Proceeds will go towards the North Dakota Public Health Association. If you have questions contact Sue Kahler at 701.355.1597 or skahler@bismarcknd.gov .